Not to be confused with Star Wars: Clone Wars (2003 TV series) or Star Wars: The Clone Wars (film). Star Wars: The Clone Wars is an American 3D CGI animated television series created by George Lucas and produced by Lucasfilm Animation, Lucasfilm and CGCG Inc. The series began with a theatrical feature film released on August 15, 2008, and debuted on Cartoon Network on October 3, 2008. It is set in the fictional Star Wars galaxy during the three years between the prequel films Episode II: Attack of the Clones and Episode III: Revenge of the Sith, the same time period as the previous 2D 2003 TV series Star Wars: Clone Wars. Each episode has a running time of 22 minutes to fill a half-hour time slot. Dave Filoni is the supervising director of the series. Genndy Tartakovsky, director of the first Clone Wars series, was not involved with the production. In early 2013, Lucasfilm announced that The Clone Wars would be "winding down". Super RTL, a German TV network, began airing the episodes on February 15, 2014. The sixth-season episodes were made available in the U.S. for streaming on Netflix, along with the entirety of the series, beginning March 7, 2014. A project known as The Clone Wars Legacy adapted unproduced story arcs into other formats, such as comics and novels. In mid-2018, Lucasfilm announced that the series would be revived with 12 new episodes to be released on Disney+. After viewing some of the completed footage of the early episodes on a big screen, the production team decided to weave the first few planned episodes together to form a theatrical release. Christopher Lee, Anthony Daniels, and Samuel L. Jackson reprised their roles as Count Dooku, C-3PO, and Mace Windu, respectively, from the live-action films (although Lee and Jackson did not reprise their roles in the series). Season 1 shows a wide variety of battles and adventures with Grievous and Dooku as the lead antagonists. Many of the episodes are stand-alone, but a common thread throughout the season is that the Republic and the Separatists attempt to convince various planets and races to side with them. In Season 2, the Sith resort to hiring bounty hunters and mercenaries to steal objects and intel or to assassinate targets for them. Meanwhile, the Jedi lead the Republic forces in an assault on the primary battle droid manufacturing facility. The first half of both Season 3 and Season 4 are diplomatic in nature; Season 3, in particular, has many stories that take place away from the battlefield. How different races and planets are affected by the galaxy-wide war are shown, as well as how the Republic Senate can make a bigger difference than even the Jedi Council at times. The first half of Season 3 is used mainly to make the Clone Wars series more cohesive as these first episodes created better chronology, setting themselves in and among the previous two seasons' episodes. The second half of both seasons, Anakin steps a little closer to the dark side. Meanwhile, the Sith experience turmoil among themselves. Season 5 is unique in that it consists of 5 four-part story arcs, 3 of which center on Ahsoka's character development. Meanwhile, the Separatists gain more ground, and the story of an old villain who has returned is further explored. Season 6 explores topics that are crucial in Attack of the Clones and Revenge of the Sith, namely the creation of the clones and the details behind Order 66. Chancellor Palpatine gains even more power, and Yoda delves deeper into the nature of the Force. On December 5, 2011, a full-length feature cut of one of the Season 3 trilogies of episodes (the one composed by "Nightsisters," "Monster," and "Witches of the Mist") was released for download on iTunes as an uninterrupted movie that was previously shown at selected screenings in 2010. The three episodes were written by Katie Lucas, who had previously written the Season 1 episode "Jedi Crash" as well as the Season 3 episodes "Sphere of Influence" and "Assassin." A repeat of season one aired in "decoded" episode format. Each installment contained unobtrusive text windows giving supplemental information about the characters and events playing out on screen. On July 19, 2018, Lucasfilm announced at San Diego Comic-Con that The Clone Wars would return with 12 new episodes of Season 7 to be released on Disney+. A trailer was released in April 2019. It will be released on November 12, 2019. At April 2005's Star Wars Celebration III, Lucas stated that "we are working on a 3-D continuation of the pilot series that was on the Cartoon Network; we probably won't start that project for another year." In July 2005, pre-production had begun on the series, according to Steve Sansweet, head of Lucasfilm fan relations. Sansweet referred to the series as "the next generation of the Star Wars saga, a cutting edge 30-minute, 3-D computer-animation series based on the Clone Wars that take place between Episode II ... and Episode III." Sansweet described the look of the new series as "a melding of Asian anime with unique 3-D animation styling." Primary production took place at the Lucasfilm Animation facility in Singapore. According to another statement by Sansweet, "Lucasfilm Animation will be hiring a total of about 300 digital artists and others in both California and Singapore locations to produce not only the series, but animated feature films in the years ahead." He said about the series, "to get the series underway, Lucasfilm Animation has hired key production and creative talent to lead the development of its first animation project." Sansweet has said that "a large component of the future of Star Wars and Lucasfilm is CGI animation." Lucasfilm Animation used Autodesk software to animate both the film and the series. The Maya 3D-modeling program was used to create the highly detailed worlds, characters and creatures. Animators also reviewed designs from the original 2003 Clone Wars series when creating the animation style. Genndy Tartakovsky, director of the first Clone Wars series, was not involved with the production, but character designer Kilian Plunkett referred to the character designs from the 2D series when designing the characters for the 3D series. In a video interview with Rob Coleman from Imagina 2007, he divulged that there were 15 episodes in production, one episode was complete, he was going to direct 5 of the first 22 episodes, reaction from licensees was very positive, and that final assembly of shows is done at Skywalker Ranch. Speaking at PaleyFest on March 3, 2007, Lucas revealed that the series would be episodic, and as such would not focus on Anakin Skywalker's story; with episodes dedicated to clone troopers and other characters. Lucas revealed further information in a fan interview, a new character named Ahsoka Tano, over 100 episodes and a possible appearance by Boba Fett. The first trailer for the series was released on the official Star Wars website on May 8, 2007. In an interview in the September 24, 2007 issue of TV Guide, Lucas confirmed that 39 episodes of the series have been completed. On April 8, 2007, Ain't It Cool News reported that musician Eric Rigler had recorded music for the series. Rigler disclosed that each planet in the Star Wars galaxy would have its own theme music. The episode Mr. Rigler performed on was based on Bulgarian music and played on Uilleann pipes. Kevin Kiner composed the original score for each episode. Stuart Snyder, who oversaw Cartoon Network and other Turner Broadcasting System cable networks from 2007 to 2014, said he became interested in the new Clone Wars series immediately upon starting the job in May 2007. Snyder flew out to San Francisco, California to screen several episodes, and told Lucas the only place he wanted to see the show was on Cartoon Network. Snyder wished to create an action/adventure block of shows on Friday night in an attempt to rejuvenate Cartoon Network. Snyder expressed confidence that the shows would help boost ratings: "You catch me at a time where I have a smile on my face because of our internal results. I can say there's a little bit of bragging on the third quarter for us." The "Young Padawans" arc from Season 5 was intended to be aired separately from The Clone Wars as a feature-length pilot for a spin-off series that never materialized. Seasons 6, 7, and 8, were in some form of production at the time of the show's cancellation in March 2013, shortly after Lucasfilm was purchased by Disney. An online comic released alongside the series depicts story snippets between episodes. The Clone Wars premiered on October 3, 2008 at 9 p.m. on Cartoon Network. The Clone Wars on Cartoon Network is shown in a 16:9 (1.77:1) aspect ratio, cropped from its original aspect ratio (OAR) of 2.35:1 (as seen in the UK Sky Premiere screenings). The show began airing on Adult Swim on March 14, 2009, making the series the first Cartoon Network series to simultaneously air on both Cartoon Network and Adult Swim. The series also aired from January 15 to March 26, 2009 on TNT. This show was the first animation aired on that channel in over a decade. On March 11, 2013, it was announced that The Clone Wars would be "winding down" to focus on the Star Wars sequel trilogy and a new series, Star Wars Rebels. On February 13, 2014, Netflix announced that starting on March 7, 2014 they would begin the US distribution of the entire TV series, including some previously unreleased director's cuts, and the previously unaired new season dubbed "The Lost Missions". The latter also became available for purchase on digital video stores, such as iTunes, in mid-2014.The Netflix distribution of the series, along with the Blu-rays, included versions of some episodes with previously censored material deemed to inappropriate for the demographic of Cartoon Network. One of the most well known edits was the removal of the character Ventress kissing a clone after she had stabbed him with her lightsaber. For the 2019 revival, the remaining episodes of the series will be exclusively available on Disney+. The show was taken off Netflix on April 7, 2019. Warner Bros. Home Entertainment distributed the videodisc releases of the first five seasons, while Walt Disney Home Entertainment handled the videodisc release of the sixth season as Star Wars: The Clone Wars – The Lost Missions. Clone Commandos, another DVD compilation that includes episode five "Rookies" as well as episodes 19 through 21 ("Storm over Ryloth", "Innocents of Ryloth" and "Liberty on Ryloth"). Darth Maul Returns, a feature-length "director's cut" edited together from Season 4 episodes "Massacre", "Bounty", "Brothers" and "Revenge" and was initially available exclusively at Target. According to the review aggregator website Rotten Tomatoes, 79% of critics have given the first season a positive review based on 19 reviews, with an average rating of 6.04/10. The site's critics consensus reads, "With an agreeably entertaining first season, Star Wars: The Clone Wars opens a fun, kid-friendly chapter of the franchise's sprawling mythology." 100% of critics have given the third and fifth seasons a positive review based on 5 reviews each, with an average rating of 8/10 and 7.85/10 respectively. 100% of critics have given the sixth season a positive review based on 13 reviews, with an average rating of 8.92/10. The site's critics consensus reads, "Sophisticated storytelling and quality animation make the sixth season of Star Wars: The Clone Wars a fitting end to the series." At Metacritic, the first season has a weighted average score of 64 out of 100 based on 9 critics, indicating "generally favorable reviews". On July 11, 2008, television critics were shown a completed episode of the series. The Hollywood Reporter's Live Feed blog called the footage "likely the most photo-realistic animated TV series ever produced." On August 31, 2008, a sneak peek of the new series was shown on Cartoon Network. IGN named it the 89th best animated series. They specifically praised the episodes "Rookies", "Cloak of Darkness", and "Lair of Grievous" saying that their storylines stood out as some of the best in the Star Wars expanded universe. Star Wars: The Clone Wars became the most-watched series premiere in Cartoon Network history. The series averaged 3 million total viewers in its debut, according to Nielsen Media Research. Cartoon Network said the Star Wars spin-off ranked as the number one channel among all major animated networks in the time slot among total viewers (the largest in the demographic for any premiere telecast of an original Cartoon series). On July 23, 2010, at the San Diego Comic-Con, Craig Glenday, editor of the Guinness World Records, presented Star Wars: The Clone Wars supervising director Dave Filoni, CG supervisor Joel Aron, and lead designer Kilian Plunkett a certificate proclaiming the cartoon series "the highest rated sci-fi animation currently on television". In 2014, WatchMojo.com ranked Star Wars: The Clone Wars as the seventh-best cartoon to have gotten cancelled. Tech Times said that, "while the Star Wars prequel films fail to make audiences care about characters like Anakin Skywalker, The Clone Wars succeeds." 37th Annie Awards Music in a Television Production Kevin Kiner for "Weapons Factory"
38th Annie Awards Best Animated Television Production "ARC Troopers"
Writing in a Television Production Daniel Arkin for "Heros On Both Sides"
2010 Teen Choice Awards Choice TV Animated Show "Star Wars: The Clone Wars"
Best Vocal Cast in a Television Series "Star Wars: The Clone Wars"
2nd Critics' Choice Television Awards Best Animated Series "Star Wars: The Clone Wars"
Best Directing for an Animated Series Brian Kalin O'Connell in "Slaves of the Republic"
Best Vocal Cast in a Television Series - Action/Drama "Star Wars: The Clone Wars"
At the time of cancellation in March 2013, 65 more episodes were in development. Thirteen of these episodes were finished to become part of Season 6: The Lost Missions, but there were still additional arcs that were never released. In September 2014, StarWars.com released details of three story arcs from the unfinished episodes. A four-episode arc continued the story of Darth Maul following the events from the season 5 episode "The Lawless". The story gave reason as to why Darth Maul was resurrected in the season 4 episode "Brothers". The four episodes were titled: '"The Enemy Of My Enemy", "A Tale Of Two Apprentices", "Proxy War", and "Showdown On Dathomir'". The arc was adapted into a four-part comic book, Darth Maul: Son of Dathomir, which debuted in May 2014. An 8-episode arc with Asajj Ventress and Jedi Quinlan Vos was adapted into a novel by Christie Golden titled Dark Disciple, released on July 7, 2015. The eight episodes were titled: Lethal Alliance, The Mission, Conspirators, Dark Disciple, Saving Vos, Part I, Saving Vos, Part II, Traitor and The Path. Two arcs consisting each of 4 episodes were released on the official Star Wars website for free in the form of complete animatics, albeit with unfinished animation as those episodes only went through the earliest stages of production. Both were fully voiced by the cast. In September 2014, four unfinished episodes were released on Star Wars' official website. The four episodes released were titled: A Death On Utapau, In Search Of The Crystal, Crystal Crisis and The Big Bang. The arc took place on Utapau with Obi-Wan and Anakin investigating an arms deal involving the Separatists and a Kyber crystal. The arc also dealt with Anakin's feelings after the departure of Ahsoka. It was also included in the season 6 Blu-ray. The unfinished animatics for Bad Batch, a four-episode arc, were screened at the Star Wars Celebration convention in Anaheim, California on April 17, 2015. Scripted by Brent Friedman, it is a four-part story arc focusing on a ragtag unit of clone commandos of the same name. The arc was subsequently released on StarWars.com for free shortly after on April 29, 2015. The four episodes were titled: The Bad Batch, A Distant Echo, On The Wings Of Keeradaks, and Unfinished Business. The trailer released for the seventh season of The Clone Wars features a member of the Bad Batch. Seven video games have been released, which are based on the style and character designs of the series. Star Wars: The Clone Wars – Lightsaber Duels, a fighting game released on November 11, 2008 for Wii. Star Wars: The Clone Wars – Jedi Alliance, an action-adventure game released on November 11, 2008 for Nintendo DS. Star Wars: The Clone Wars – Republic Heroes, another action-adventure game taking place between Season 1 and Season 2, released on October 9, 2009 for Microsoft Windows, Xbox 360, PlayStation 3, Wii, PlayStation Portable, PlayStation 2 and Nintendo DS. Clone Wars Adventures, an online PC game launched on September 15, 2010 online by Sony Online Entertainment and shut down on March 31, 2014. Lego Star Wars III: The Clone Wars, released in March 2011 by TT Games for PlayStation 3, PlayStation Portable, Xbox 360, Wii, Nintendo DS, PC, Mac, and Nintendo 3DS, which further stylizes the characters as part of the Lego Star Wars theme and is mostly based on the first two seasons. Star Wars: The Clone Wars Pinball, a virtual pinball adaptation of the series' original run, released in 2013 as a purchaseable add-on for Zen Studios' Star Wars Pinball collection for most seventh- and eighth-generation home video game systems, computers and mobile devices. Disney Infinity 3.0, released in September 2015 by Disney Interactive for PlayStation 4, PlayStation 3, Xbox One, Xbox 360, Wii U, Microsoft Windows, iOS and Android, which stylizes select major characters from the show as action figures that become playable only via a toys-to-life NFC system. Each copy of the game comes with the playset, "Twilight of the Republic", which is an alternate storyline set during the Clone Wars era, along with two starting characters, Anakin and Ahsoka. Other characters from the show also appear, although most of them are not playable or are fought as bosses. Star Wars: Galactic Defense, a now-defunct tower defense game released on iOS and Android by DeNA, in which a number of playable champions include characters from the show. Several levels in the main campaign also take place on the planet Felucia, a major Clone Wars hotspot featured in some episodes. Star Wars: Galaxy of Heroes, a turn-based RPG also released on iOS and Android by Electronic Arts, where some levels take place on planets depicted in the show (such as Dathomir) and a number of collectible, playable characters are from the show. Star Wars: Force Arena, an online MOBA game released on iOS and Android by Netmarble, where an August 2017 update allowed players to recruit characters, vehicles and battle units from the series, as well as battle on planets like Felucia. Star Wars Battlefront II, a video game available on Microsoft Windows, PlayStation 4 and Xbox One, in which players can battle on or directly above planets like Ryloth and Kamino, where some battles in the series were fought. Wood, Taylor, Lanter and Burton are also expected to reprise their voice roles for four new playable heroes (General Grievous, Obi-Wan Kenobi, Anakin Skywalker and Count Dooku, respectively) being added to the game's upcoming third season in late 2018, themed after the Clone Wars. ^ a b "Star Wars: The Clone Wars - The Lost Missions Now on Netflix". StarWars.com. Archived from the original on March 7, 2014. ^ "index". archive.org. Archived from the original on August 26, 2008. ^ "Cartoon Network's official page". Cartoonnetwork.com. Retrieved January 25, 2013. ^ "Star Wars: Community | Meet the Producer and Director Of The Clone Wars at Celebration IV". Web.archive.org. Archived from the original on January 16, 2008. Retrieved January 25, 2013. ^ a b c "Movie News, Reviews, Interviews and More! – NEW Animated Star Wars: Clone Wars Series Fully in Production!". IESB.net. January 29, 2007. Archived from the original on February 29, 2008. Retrieved January 25, 2013. ^ "A New Direction For Lucasfilm Animation". StarWars.com. March 11, 2013. Archived from the original on May 23, 2013. Retrieved March 11, 2013. ^ Franich, Darren (March 11, 2013). "Star Wars TV: Clone Wars canceled, Detours postponed". Entertainment Weekly. Retrieved February 23, 2017. 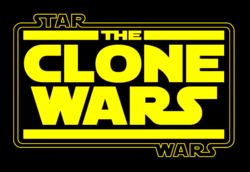 ^ ""Star Wars: The Clone Wars" Season 6 Coming February 2014 in Germany". toonzone.net. January 24, 2014. Retrieved February 1, 2014. ^ "Exklusive Premiere bei SUPER RTL: Sechste Staffel der Animationsserie "Star Wars: The Clone Wars" in deutscher Erstausstrahlung" (in German). SUPER RTL. January 16, 2014. Retrieved February 1, 2014. ^ a b Itzkoff, Dave (February 14, 2014). "'Clone Wars' Moves to Netflix". The New York Times. Retrieved February 14, 2014. ^ a b c d e "The Clone Wars Legacy". StarWars.com. September 24, 2014 – via YouTube. ^ a b c Brooks, Dan (July 19, 2018). "SDCC 2018: Star Wars: The Clone Wars to Return with New Episodes". StarWars.com. Retrieved July 19, 2018. ^ "George Lucas Talks 'Star Wars: The Clone Wars'". Archived from the original on June 4, 2011. ^ "Force-Cast Clone Wars Roundtable, interview with Dave Filoni and Henry Gilroy". Archived from the original on October 6, 2008. Retrieved November 6, 2018. ^ "iTunes releases "The Nightsisters Trilogy"". ^ "The Clone Wars: Decoded on May 1 on Cartoon Network". StarWars.com. Archived from the original on June 4, 2011. ^ Young, Bryan (February 28, 2013). "Exclusive: Tim Curry Joins Star Wars". The Huffington Post. Retrieved March 1, 2013. ^ "– Latest News – Anthony Daniels Radio Interview". Theforce.net. June 10, 2006. Retrieved January 25, 2013. ^ "Star Wars: Community - starwars.com at Comic-Con 2005". StarWars.com. July 12, 2005. Archived from the original on March 23, 2008. Retrieved November 6, 2018. ^ "Lucas on the Star Wars TV Projects". ComingSoon.net. August 2, 2005. Retrieved November 6, 2018. ^ "Autodesk Maya software serves as animation platform for new Star Wars: The Clone Wars animated feature film and TV series". TradingMarkets.com. August 26, 2008. Archived from the original on June 29, 2012. Retrieved November 6, 2018. ^ Martinez, Kiko (August 27, 2008). "Hispanic animator helps create new Star Wars universe". Extra. Archived from the original on February 14, 2010. Retrieved November 6, 2018. ^ "– Imagina 2007 : Interview de Rob Coleman". Mintinbox.net. September 20, 2008. Archived from the original on February 8, 2007. Retrieved January 25, 2013. ^ "Paley Fest: George Lucas Gives Details on the Star Wars TV Shows". Retrieved May 31, 2007. ^ "IESB Video Portal". IESB.net. Archived from the original on March 24, 2007. Retrieved May 31, 2007. ^ "Video". Star Wars. Retrieved January 25, 2013. ^ "George Lucas on his two Star Wars TV series, Heroes and HBO's Rome - Celebrity and Entertainment News". TVGuide.com. Archived from the original on June 8, 2008. ^ merrick. "A Teeny Tidbit About One Of Those Nutty Little STAR WARS TV Series We Keep Hearing About!! – Ain't It Cool News: The best in movie, TV, DVD, and comic book news". Aintitcool.com. Retrieved January 25, 2013. ^ Swartz, Kristi E. (September 2, 2008). "Cartoon Network is eager to use the force". The Atlanta Journal-Constitution. Archived from the original on November 18, 2011. Retrieved September 2, 2008. ^ Venable, Nick (November 24, 2016). "The Last Star Wars Project George Lucas Considered Before Selling To Disney". Cinemablend. Retrieved December 19, 2016. ^ "Clone Wars Comic". StarWars.com. Archived from the original on October 3, 2008. Retrieved October 10, 2008. ^ "The Force is with Netflix". Netflix. February 13, 2014. Archived from the original on February 19, 2014. Retrieved November 9, 2018. ^ @starwars (June 17, 2014). "Now available on @iTunes: #TheCloneWars season 6, #TheLostMissions!" (Tweet) – via Twitter. ^ "Scenes cut from Star Wars". Wookieepedia. Retrieved March 25, 2019. ^ "5 Moments When Asajj Ventress Surprised Us". StarWars.com. August 11, 2015. Retrieved March 25, 2019. ^ "Star Wars: The Clone Wars The Complete Season Two on DVD and Blu-Ray!". StarWars.com. May 27, 2010. Archived from the original on June 15, 2011. Retrieved September 14, 2010. ^ "Star Wars: The Clone Wars - Darth Maul Returns". Target. Archived from the original on March 5, 2013. Retrieved March 14, 2013. ^ Lambert, David (June 29, 2012). "The Clone Wars - 'The Complete Season 4' on DVD and Blu-ray Disc". TVShowsOnDVD.com. Archived from the original on July 1, 2012. Retrieved June 29, 2012. ^ "Star Wars: The Clone Wars - The Complete Season Four DVD". Amazon.co.uk. Retrieved January 25, 2013. ^ "Star Wars: The Clone Wars - Season 4". Ezy DVD. Archived from the original on December 30, 2012. Retrieved April 12, 2012. ^ a b "SWCE 2013: Star Wars: The Clone Wars The Complete Season Five and Seasons 1-5 Box Sets Coming This Fall". StarWars.com. July 26, 2013. Archived from the original on July 28, 2013. Retrieved July 29, 2013. ^ "JB Hi-Fi - Star Wars: The Clone Wars - The Lost Missions 2 Blu-Ray". jbhifi.com.au. ^ "Darth Maul Returns to Target-exclusive DVD in Director's Cut of The Clone Wars". Club Jade. Retrieved September 27, 2012. ^ "Star Wars: The Clone Wars: Season 1". Rotten Tomatoes. Fandango. Retrieved April 16, 2019. ^ "Star Wars: The Clone Wars: Season 3". Rotten Tomatoes. Fandango. Retrieved May 28, 2018. ^ "Star Wars: The Clone Wars: Season 5". Rotten Tomatoes. Fandango. Retrieved May 28, 2018. ^ "Star Wars: The Clone Wars: Season 6". Rotten Tomatoes. Fandango. Retrieved April 16, 2019. ^ "Star Wars: The Clone Wars Reviews". Metacritic. CBS Interactive. Retrieved January 25, 2013. ^ "IGN Top 100 Animated Series". IGN. Ziff Davis. ^ "89, Star Wars: The Clone Wars". IGN. January 23, 2009. Archived from the original on January 19, 2009. Retrieved January 24, 2009. ^ ""Clone Wars" a new star for Cartoon Network". Reuters. October 7, 2008. Retrieved October 7, 2008. ^ "StarWars.com - Record-Breaking Clone Wars Series to Visit Kamino". archive.org. Archived from the original on June 22, 2011. ^ "Top 10 Best Cartoons That Got Cancelled". WatchMojo.com. ^ Parrish, Robin (July 31, 2015). "Why 'Rebels' And 'The Clone Wars' Are The Best Star Wars Material In 30 Years". Tech Times. Retrieved May 20, 2016. ^ Goldman, Eric (March 8, 2014). "Star Wars: The Clone Wars - Season 6 "The Lost Missions" Review". IGN. Ziff Davis. ^ Hughes, Jason (September 26, 2014). "Unfinished 'Star Wars: The Clone Wars' Episodes Released Online". The Wrap. Retrieved September 27, 2014. ^ "Star Wars: The Clone Wars "Bad Batch" 4-Episode Arc Coming to Star Wars Celebration - StarWars.com". StarWars.com. ^ Brooks, Dan (July 25, 2018). "SDCC 2018: Fans React to the Return of Star Wars: The Clone Wars". StarWars.com. Retrieved March 10, 2019. ^ "Star Wars Battlefront II Starfighter Assault Trailer". YouTube. Retrieved August 24, 2017.